Classical Piano Lessons London – Do You Make Your Piano Sing? If you are visiting this page, you might obviously love playing the exquisite pieces that these magnificent pianists have composed. Choosing to study and discover the astonishing meaning hidden in between the notes written on the score is a fascinating process which is sadly so rarely taught and so rarely understood by even the most advanced piano teachers and performers. 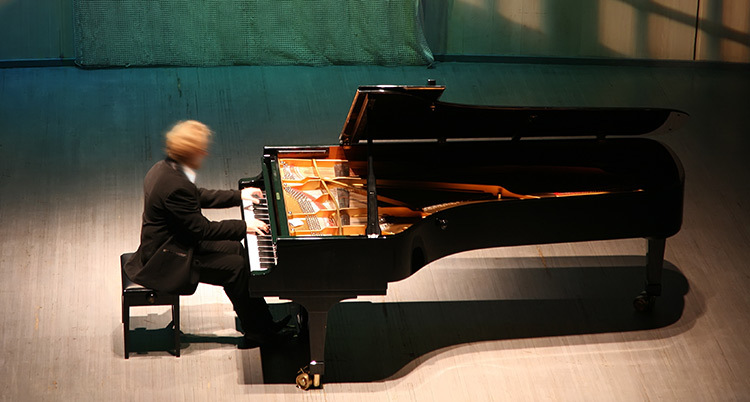 (85% of professional world-class pianists including famous ones do not have a complete understanding of what it means to REALLY PLAY THE PIANO USING THEIR ENTIRE BODY IN PERFECT SCIENTIFIC RELATION TO THE VERY NATURE OF THIS FASCINATING INSTRUMENT). In my opinion, the only pianists that I know and fully admire are Dinu Lipatti, Heinrich Neuhaus, Samson Francois, Alfred Cortot and Walter Gieseking (disclaimer: there might be distinguished pianists in the world today that I don’t know – but none of the performing professionals touch me in the same manner as the pianists listed above who are unfortunately not alive anymore). Understanding the music behind the written score and the art of interpretation is too often neglected (like a lawyer who draft a tedious legal document without using creativity and finesse…) and piano teachers usually only give you feedback on the right or wrong notes you are playing, and in the best case scenario, perhaps a faint idea of the dynamics written on the score. This is only 1% of what you ought to know if you want to be successful at playing classical piano proficiently. By only playing the notes on the score without a specific procedure in relation to the composition is careless and sloppy. To make matters worse, individuals who feel energised by their technical virtuosity often suffers from an extreme case of not knowing what they are doing (this actually does the composer harm and ruins the music). You see ladies and gentlemen, the art of playing the piano is actually understanding what the composer intended and how to use technique, fingers, hands and the individual’s body to achieve the ultimate goal that we all strive for: MAKING THE PIANO SING! After having completed her studies to the highest degree in Paris and in Switzerland, Celine Gaurier-Joubert decided to dedicate her time not to perform but to fully understand the art of playing the piano and especially the art of the touch, only understood by an exceptionally few concert pianists. Passing on her discovery and information to her students is for her fascinating, and you should certainly experience her piano lessons and benefit from her outstanding understanding and knowledge of piano playing. Hearing people banging the instrument and play notes without feeling the music behind it is for her a real disappointment and teaching you how to understand music is her greatest enjoyment. 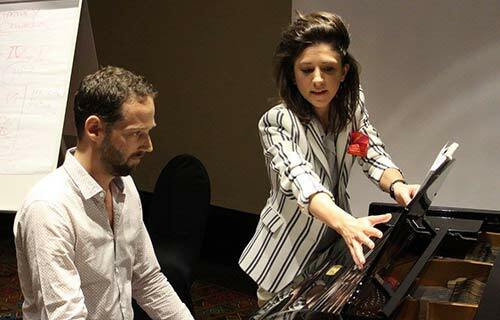 Our master piano instructor Celine Gaurier-Joubert is a concert pianist and master adult piano pedagogue who will teach you how to play the piano in the fastest and most effective method possible. You will be hard-pressed to find a similar quality piano teacher in Europe. She loves teaching all levels of playing and has a deep passion for teaching adults! We provide classical piano instruction for adults of all musical abilities. You can also consider our intensive piano lessons in London designed to help you gain that extra edge in your playing in a short period of time! Classes take place at our formidable piano studio in Mayfair near Park Lane and Grosverner Square as well as in the City of London – EC2, EC3, EC4 and near Chancery Lane Station. All levels (beginners to advanced) are accepted and welcomed into our private piano programs.